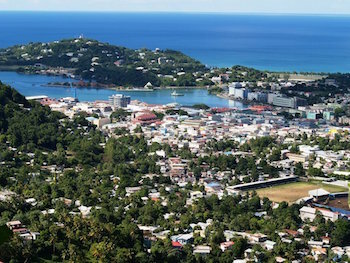 Castries, capital of St. Lucia, is also the largest city on the island. The latest estimates show its population as about 20,000. St. Lucia with a total population of 163,362 (July 2014 est.) is part of the Windward Islands chain which forms the boundary between the Atlantic Ocean and the Caribbean Sea. Arawak and Carib Indians inhabited St. Lucia exclusively until 1502, when a group of French sailors became the first Europeans to reach the island. European settlement, however, was stalled for more than a century by fierce resistance from the Caribs. The French founded Castries in 1650, naming it “Carénage,” which means “safe anchorage,” in reference to the city’s deep water port. It adopted the name Castries in 1756 in honor of Charles Eugène Gabriel de La Croix, Marquis de Castries and Commander of a fleet of French ships. By 1746 the French established an agreement with the Caribs that allowed more European settlement on the island. Also by that point the French had introduced sugar plantations and developed a thriving agricultural economy based on forced African labor. Meanwhile St Lucia became a major prize in the British-French rivalry for control of the Caribbean and its lucrative sugar economy. During the 17th and 18th centuries England and France were at war fourteen times, during which control of the island switched seven times. At one point St. Lucia was considered so valuable because of its sugar production that the British and French were willing to trade all of Canada for the island. In 1814 the British finally took permanent control of the island, making Castries a major naval port in the region over the next three decades. Because of its harbor, Castries was the only Eastern Caribbean port that could accommodate the largest warships. Despite the abolition of slavery in 1833, the island’s economy remained based on the production of tropical commodity crops like sugar, bananas, and coffee. By this point 90% of the residents of both Castries and the island of St Lucia were of African ancestry. From 1958 to 1962 St Lucia was a member of the now defunct West Indies Federation. The island finally gained independence from Great Britain on February 22, 1979, and Castries became the new national capital. Notwithstanding the fact that Castries had been under British control for over two centuries, the city retains a distinctly French flavor, particularly evident in the cuisine and in place names. Significant landmarks include the Cathedral of the Immaculate Conception. Built in 1897, it is the largest church in the Caribbean. Derek Walcott Square, named in honor of St. Lucia’s Nobel Prize-winning poet, is another major landmark. Walcott was one of two St Lucian Nobel Prize winners (the other winner was economist Sir Arthur Lewis). Castries hosts the secretariat of the Organization of Eastern Caribbean States and the headquarters of the Eastern Caribbean Supreme Court. Castries, St Lucia - Lonely Planet, http://www.lonelyplanet.com/st-lucia/castries; St Lucia History, Language and Culture - World Travel Guide, http://www.worldtravelguide.net/castries › Destinations › Caribbean › St Lucia; Government of Saint Lucia http://www.govt.lc/; St Lucia - Original Official Guide - Geographia, http://www.geographia.com/st-lucia/index.html. Original Official Guide – Geographia, http://www.geographia.com/st-lucia/index.html.